Over the month of January, water-year precipitation increased from 87% of average to 93% of average, and snow-water-equivalent increased from 89% of average to 96% of average. Streamflow throughout the watershed was generally above average, including outflow from Island Park Reservoir, which, at 508 cfs, was 134% of average and the highest since the winter of 2011-2012. The only negative aspect of the current water situation is that January was much warmer than average, limiting snow accumulation at lower elevations and setting up the snowpack to melt early and rapidly. A complete guide to the climate and streamflow stations referenced in this blog and my daily water reports is available here. If you would like to receive the daily reports via email, please contact me at rob@henrysfork.org. The month of January was very warm, 5 degrees F warmer than normal across the whole watershed. Monthly mean temperature was at least 4 degrees warmer than the 30-year average at all 12 stations I track and as high as 7 degrees above average at Island Park. Pine Creek Pass and Crab Creek stations set new record high monthly mean temperatures. Monthly average temperature at Pine Creek Pass was 27.8 degrees F, edging out the old record of 27.5 degrees, set in 2005. Monthly average at Crab Creek was 25.3 degrees, beating the old record of 24.4 degrees, set in 2003. January precipitation total was very close to average over the watershed as a whole, although there was quite a bit of geographic variability. 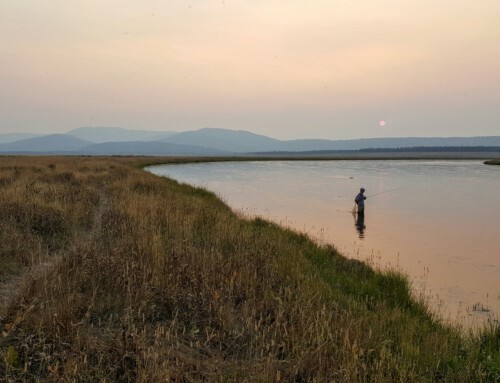 Sites in the Teton subwatershed and all sites in the upper Henry’s except Black Bear received very close to average precipitation for the month. January precipitation at Island Park was 111% of average. Sites on or adjacent to the Yellowstone Plateau—Black Bear, Lewis Lake Divide, and Grassy Lake—all received above-average precipitation during January. Precipitation in the valleys was a real mixed bag; precipitation at Ashton and Rexburg was well above average, whereas that in Teton Valley was well below average. Between January 1 and February 1, watershed-total precipitation for the water year increased from 87% of average to 93% of average. Accumulated precipitation since the beginning of the water year, by subwatershed. New snow-water-equivalent (SWE) over the month followed a similar pattern: most sites gained average to above-average SWE over the month, and the Yellowstone Plateau sites were the big winners. Between January 1 and February 1, accumulated SWE for the water year increased from 89% of average to 96% of average. Accumulated snow-water-equivalent as a percent of average, by subwatershed. Streamflow was generally above average during January, as it has been since early November. Watershed-total natural streamflow is currently 108% of average: 98% of average in the Henry’s Fork upstream of Ashton, 116% of average in Teton River, and 126% of average in Fall River. Over the month of January, natural watershed inflow between Henry’s Lake and Island Park averaged 448 cfs, which is 109% of average and 45% higher than last year’s value of 309 cfs. This continues to indicate good recovery of Big Springs and other groundwater-fed streams from the 2013-2016 drought. Graph of natural watershed inflow (“reach gain”) between Henry’s Lake and Island Park Reservoir. Regulated outflows from Henry’s Lake and Island Park Reservoir were above average in January. 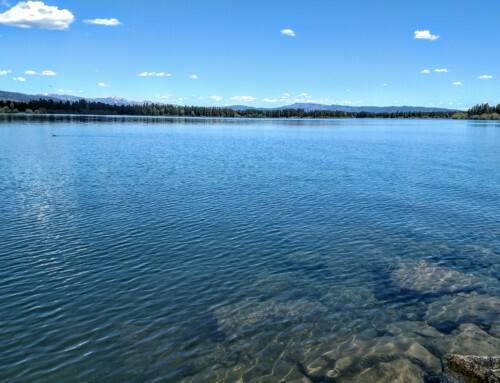 Despite this, Henry’s Lake gained 310 acre-feet over the month, and Island Park Reservoir gained 1,426 ac-ft, due primarily to precipitation falling directly on the reservoir surface. Monthly mean outflow from Island Park over the month of January was 508 cfs, the highest since the winter of 2011-2012. Outflow from Island Park Reservoir. Considering reservoir storage, streamflow, precipitation so far this water year, and SWE, overall water supply is well above average going into the second half of the snow-accumulation season. The effect of warm temperatures on snow accumulation is the only negative aspect of the water supply so far this winter. This effect is explained in the figure below. Water-year-to-date precipitation (left) and SWE (right) as a function of elevation. The left panel shows water-year precipitation to date at each of the nine SnoTel sites in the watershed as a percent of average, plotted against elevation. There is no statistically significant effect of elevation on precipitation to date as a percent of average (P = 0.57, for you statistically minded readers). The R2 value indicates that only 5% of the variation in precipitation accumulation was explained by difference in elevation. Bottom line here: relative to average, precipitation received to date is statistically constant across elevations at 93% of average, plus or minus some random variability across sites. Compare this to the right panel, which shows SWE as a percent of average, plotted against elevation. The slope of the linear relationship between SWE and elevation is statistically significant, as indicated by the P-value of 0.02. For the non-statisticians, this means that there is less than a 5% chance that we are wrong in concluding a dependence of SWE on elevation. The R2 value indicates that 56% of the variability in SWE is explained by elevation. As elevation increases, SWE as a percent of average also increases. Because precipitation showed no pattern with elevation, this dependence of SWE on elevation cannot be explained by precipitation. The only other possible mechanism for the SWE pattern is temperature. Warm temperatures have limited snow accumulation at the low-elevation sites, even though these sites have received just as much precipitation, as a percent of average, as the higher-elevation sites. The conclusion is that a statistically significant fraction of precipitation that has fallen at the low-elevation sites has already contributed to streamflow this winter and has not remained in the snowpack where it will contribute to streamflow next spring and summer as it melts.